Post cards of: i). Fred Benson at 19; ii) Fred Benson at 26; iii) Fred Benson by Frank Slater in 1926; and iv) Hugh, Arthur and Fred Benson in 1882. 30p each. In addition, the Society always has a stock of antiquarian editions of books by E. F. Benson available for sale to members. Details are available on application to the Secretary and also on this website under Books for Sale. All these publications are available from The Secretary, The E. F. Benson Society, The Old Coach House, High Street, Rye TN31 7JF. 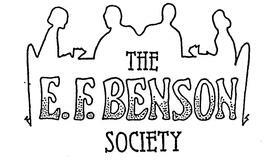 To place an order, please fill in the form below indicating of the above the books that you wish to order and enclosing a cheque payable to The E. F. Benson Society with your order. UK postage is free for items under £6 then it is £1.50 for items over £6. Overseas and EU is £2 for items over £6 and it is sent Air Mail. Alternatively you can also pay through PayPal using the Society’s e-mail address: info@efbensonsociety.org Do use this if you are outside the UK, it is easier for you. If you use this facility, please also e-mail the Society with details of your purchase, name address etc. for us to satisfy your order. Please supply the book(s) marked above.